A few weeks ago I did a video tutorial of the Traditional Granny Square, but I also talked a little bit about how “officially” a granny square is any motif worked flat, in a square, from the center out. 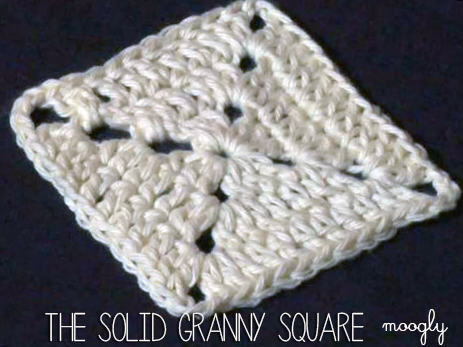 Nonetheless, there are a few squares that are considered typical, while the rest rarely get called “grannies.” One of the better known simple squares is the Solid Granny Square, and here’s how it’s made! Switch up to HD using the little gear icon for optimized viewing, or use a smaller resolution if you have a slow internet connection. Round 1: Ch 5 (counts as first dc and ch 2). [Dc 3 into ring, ch 2] 3 times. Dc 2 into ring, join with a sl st to 3rd ch of ch 5. Round 2: Sl st into the ch sp. Ch 5, dc 2 into the same ch sp. *Dc into the next 3 sts, [dc 2, ch 2, dc 2] in the ch sp. Repeat from * three times, then dc into the last 3 sts, dc in the ch sp. Join with a sl st to 3rd ch of ch 5. Round 3: Sl st into the ch sp. Ch 5, dc 2 into the same ch sp. *Dc into the next 7 sts, [dc 2, ch 2, dc 2] in the ch sp. Repeat from * three times, then dc into the last 7 sts, dc in the ch sp. Join with a sl st to 3rd ch of ch 5. Round 4: Sl st into the ch sp. Ch 5, dc 2 into the same ch sp. *Dc into the next 11 sts, [dc 2, ch 2, dc 2] in the ch sp. Repeat from * three times, then dc into the last 11 sts, dc in the ch sp. Join with a sl st to 3rd ch of ch 5. At this point you can fasten off, or you can just keep going! I think you can see how the pattern works by now – dc in each dc from a previous round, and work a set of dc 2, ch 2, dc 2 in each corner ch sp. There are, of course, many variations on this square as well. To get a fully solid square, some patterns work 3 dc in each corner.. Others work a big chain 4 in each corner. This video shows a sort of middle ground with the ch 2 corners. Changing colors each row is another great way to change things up, and one of the reasons granny squares are so persistently popular – they’re a great way to use up scraps and odds and ends of yarn! I hope you’ve enjoyed this video, and if you have ideas for more videos you’d like to see from Moogly, please let me know in the comments! I love to take requests! I have to tell you, I sincerely appreciate the step-by-step instructions you provide for the various squares, stitches, etc. And, of course, the collections of ten -somethings, or round-ups of various designs. I think I’ve pinned quite a few of them for future reference! Anyways, just wanted to say thank you!! Thanks so much for saying so Darlene – you’re very welcome! OMG!!!! thank you for the step by step and the video…. You make this look so easy to do..I have tryed a few granny squares and i just cant do them, so i am going to try yours… BUt i was wondering instead of making a bunch of sqaures, can i jut make this 1 big square for a baby blanket?? Absolutely Dee! 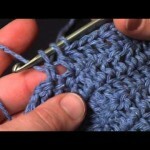 Just keep going and going and going… It’s a fantastic way to make a fast square blanket! Love everything you post!! Thank you! 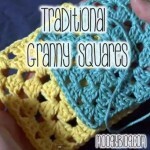 I wanted to ask …on the solid granny square here what needle and yarn did you use ? A very very wonderful and easy to follow set of instructions. Thank you very much. Enjoyed making the granny square. So glad Lakshmi! Thank you for commenting! Thank you so much for this tutorial, I have been struggling with a few attempts and at last this one is just so easy to understand you certainly have a gift explaining the tutorials so we understand clearly. 😀 Thank you Charmaine, so glad it worked for you! I have to say this is the first granny square I have done (not tried ) and was able to do. I have been crocheting for over a yr now and never understood the granny square. Thank you so much for your step by step instructions ! 😀 You’re so welcome Sharon! I’m so glad it helped! I know people who crocheted for years before the granny square “clicked” for them, and then there are those who only made grannies for years! Such a funny thing! This is the granny square I’ve been looking for to make my son a blanket. He’s 6’2 and wants a king size blanket for Christmas. He doesn’t care what kind just nothing blue. This will be a great portable project and I can control the size. Thanks! the sound on this page is so low, a person can’t hear what your saying, have mine on as loud as it will go, can’t hear you !!!! Hi Janet! Have you tried turning up the volume on the video itself? 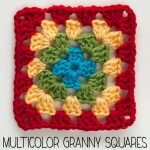 I love this granny square and in fact love everything on your site. I’m currently working on an afghan for a male in this design. 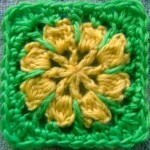 You can see the beginnings here http://freecoolpatterns.com/ssimple-solid-granny-square-afghan-done-in-crochet/. 😀 Thank you so much! Looks like you’ve got your crocheting cut out for you! I love making motifs and granny squares. However, the challenge for me is knowing how to join them together. What is the best way to join these together? Thanks for all the information you provide. It is much appreciated on my end! Thank you so much! took me a while to figure out purely because I’m left handed. But your videos made it so easy to understand! i’m using this square as a project for an afghan! 😀 I’m glad to hear it, thank you Emma! I like to crochet….. I am a beginner tho and am wandering if you could globalised in videos? Ty so much tamare.I’ve been crocheting for over 50 yrs now.I have no problem doing complicated and challenging projects But the granny square seems like a.”Why can’t I do this”.LOL.You really made this simple for me.TY again. 🙂 You are very welcome Denise!! Thank you! 😀 Thank you Heather, I’m so glad to hear it! What would I need to do to make this with extended single crochet stitch? What changes/adjustments would need to be done to make it work out right? This is an excellent tutorial video. I like the solid granny square better than the traditional one. Thank you! Love your patterns and wondering if you have one for a cute puppy head to use for a lovey blanket, seen some but trying to find one with a floppier ear, thx so mch, have made several items from your great selections of free patterns, love this site! Thank you so much Cindy! I’m afraid I don’t have one myself, but two friends of mine have free patterns that might work for you! http://poshpoochdesignsdogclothes.blogspot.com/2014/01/crochet-long-starts-today-puppy-lovie.html and http://www.repeatcrafterme.com/2012/08/puppy-dog-lovey-blanket-crochet-pattern.html And another idea would be to “borrow” ears from another project and sew them to a pattern you like otherwise! Thank You so much, I:m stupid and i can do a Granny Square and i love this pattern, I’m going to make a blanket now, and what size needle do i use if i want to make a tablecloth, I will use thread. Thanks Again….I love the step by step, thats the only way i can get it. I love this pattern. I’m a new old crocheter! Years ago my mom taught me how to crochet but she passed many years ago. I am again trying to pick up this craft & sometimes stumble on the directions. Is it possible to just keep making the square bigger to make a blanket or afghan? Just thought that might be a cute blanket for my granddaughter’s bed. Thanks for your patience for an oldtimer! The video doesn’t seem to be showing anymore… your videos are so super helpful, I wondered if you could re-upload it? Thank you so much for letting me know! Just had to add a missing “s” from when everyone switched from http to https. 🙂 All fixed now!